Once more, Spring is here! Actually the past 15 days were pretty mild and sunny already. The music and noises made by Carnival succeeded in chasing away the cold spirits of the Winter. Alsatian Easter Bunny. I purchased this from Melodie de La Vie, a beautiful shop in Riquewihr. Traditional farm near La Vancelle, on the road to the Fouchy pass. Blue horizons spreading south from the Vosges mountains over the hidden vineyards up to the far Alps (to be seen in the background). New and tender leaves on the hills. Seen from the bed room of our White Stork holiday apartment. Cutting back the vines on the Schoenenbourg vineyard in Riquewihr. Cherry trees blossoming. On the road up to Thannenkirch. General view of Riquewihr in the early Spring. The mood of the people is better also. Some sun and higher temperatures are attracting more people to the streets and even to the hiking paths. In the main street of Riquewihr, chairs and tables are back in the streets in front of the restaurants when the sun shines. Flowers are again available on open air markets and tinging the windows with colorful spots when Easter is getting nearer. Let’s set Spring to music! Alsace homeland of the Easter Bunny? In a week or so it will be Easter. 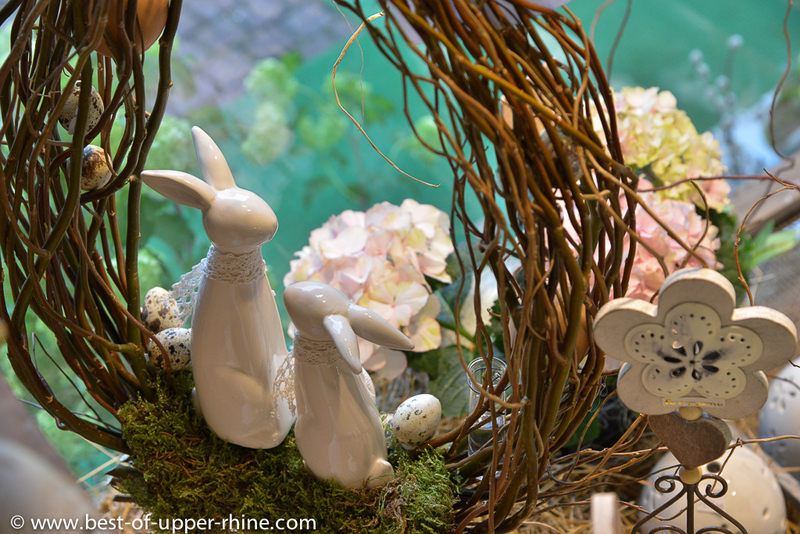 Easter is, apart from its Christian meaning, the celebration of Spring par excellence. 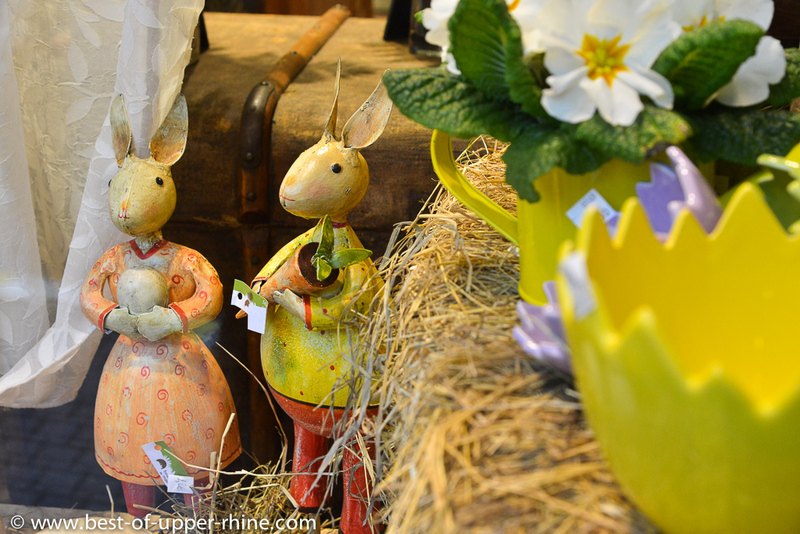 In Alsace and the Upper Rhine valley Easter is the time when the Easter Bunny appears. Some years later, my younger sister used to follow the same tradition with his cousin. They were 7 or 8 years old at that time and had their mind full of foolery or was it just imagination? They built the nests but also hided some traps in the garden, hoping to be able to capture the Easter Bunny! Alsatian Easter Bunny in the Leonidas chocolate shop in Strasbourg. 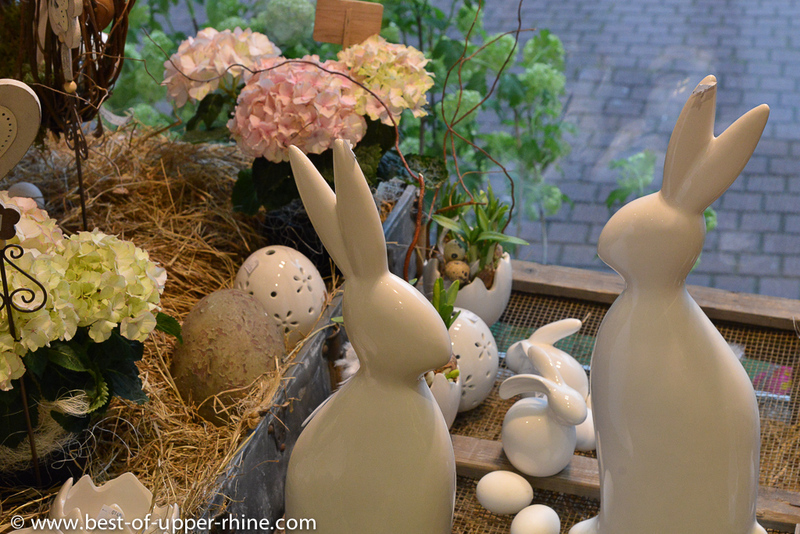 Easter Bunnies by Villeroy & Boch in Strasbourg. “Osterlammele” or “Oschterlammele”, “lamele” or “Lammele” means “little Easter lamb” in Alsatian. It is a traditional Alsatian pastry shaped as a lamb (a kind of sponge cake). The Lammele is a typical Alsatian tradition. Ancient Catholic theologian Thomas Murner from Obernai already stated in 1519: At Easter the young man offered a Lammele to his fiancée. It was also offered to children at the return of the Mass of Easter Day. After Lent, this biscuit, rich in eggs whose consumption was forbidden during Lent, allowed to sell the accumulated stock before Easter. The lamb, sprinkled with icing sugar, was decorated with a paper flag in the colors of the Vatican flag (yellow and white) or Alsace (red and white). Every year our holiday apartments are getting an Easter decoration. Spring is a beautiful time to stay in one of our holiday homes in Riquewihr, Alsace. I really enjoyed reading this. I have a fond affection for stories of traditions, passed along through generations. It’s interesting to see how one of my childhood traditions got its start. Thanks!